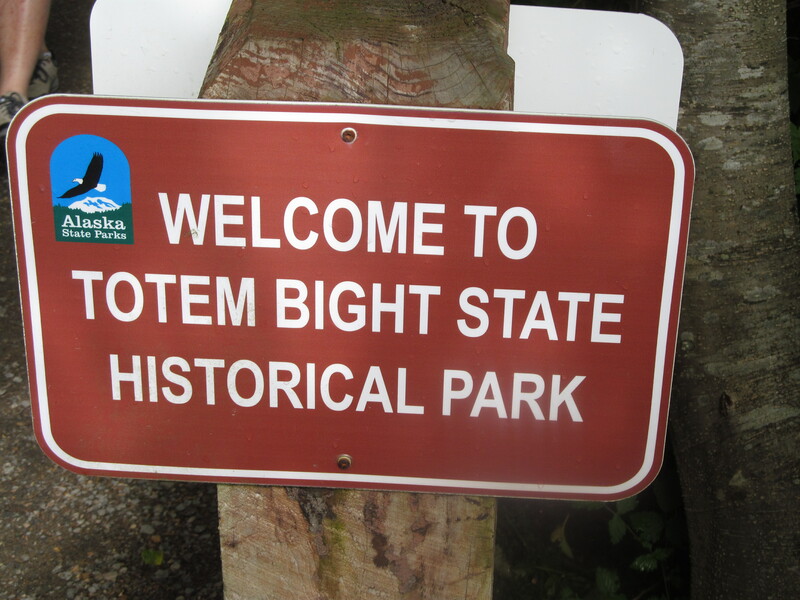 One of our stops in Alaska was Ketchikan, where we visited the Totem Bight State Park. At Totem Bight, we had the opportunity to view many replica native totem poles on a rare non-rainy day in Ketchikan. It was interesting to discover how the totem poles were made (we saw one being carved by a native carver atop Mt. Roberts in Juneau), the kind of wood that was used, and that they would usually last about 100 years, even in that rainy climate. But the most interesting thing I discovered was that many of the totem poles told a story about the beliefs of the native people. The sad thing is that some of the stories and totems have been lost over time. Our guide told us that when missionaries first arrived in Alaska and begin to work among the native people, the missionaries made the native people tear down the totem poles, thinking that they were graven idols. They didn’t realize that the poles were simply telling the stories of the people. Many poles and many stories were lost because of misunderstanding. Viewing the totem poles and the stories that they told, I started thinking about story telling and how we tell our stories of culture, family, and faith. It was not too many years ago that people would gather around a camp fire or on a porch and tell stories. Today, much of that culture is gone. Today, we go inside our own homes, turn on the television and allow the TV to tell us the story. Or we sit at our computer and write our story on facebook or on a blog (like this one) or maybe “tweet” out a story (as long as it is 240 characters or less.) It seems that it is becoming more and more rare to sit down together and talk face to face in our modern culture. the cemetery the Saturday before Easter and grandmother would take us to all the headstones of our deceased family members, tell us about them and how we were related to them. 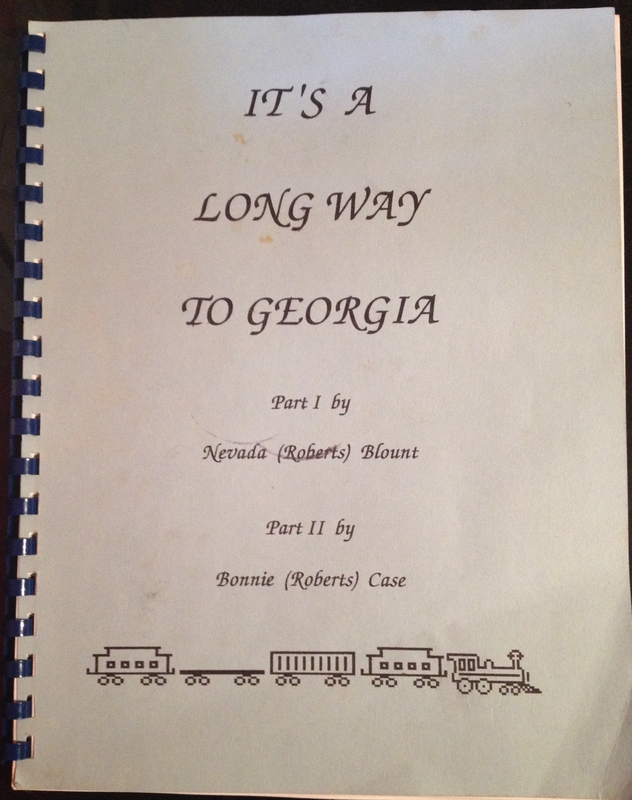 One of my most treasured family items is a memoir written by my grandmother titled “It’s a Long Way to Georgia”, telling of her family’s move from Georgia to Louisiana when she was a little girl. I never met my mother-in-law, Sharon Kaye Rousseau (she passed away about a month before I met Jana), but I feel as if I know her through the stories that Jana and others have told me of her. I hope and pray that we never forget to tell these family stories to one another and to our children. Maybe the most important story to tell is one of faith. As a pastor, I think I have the greatest job in the world to tell the true story of God’s love, grace, mercy and faithfulness each day. But isn’t telling God’s story and the story of Jesus’ life, death, and resurrection, a job for each and every one of us? If we don’t tell the story, who will? It has been said that the church is only one generation away from extinction. With the decline of many mainline denominations, church attendance, and the cultural influence of the church, that statement may be more true today than it has been since the very beginning of the church. Maybe the story needs to be told in a new way, but God have mercy on us if we fail to tell the story! In the United Methodist Hymnal there is a hymn titled “I Love to Tell the Story”, written by Katherin Hankey (find the history of this hymn here: http://www.gbod.org/resources/history-of-hymns-i-love-to-tell-the-story). 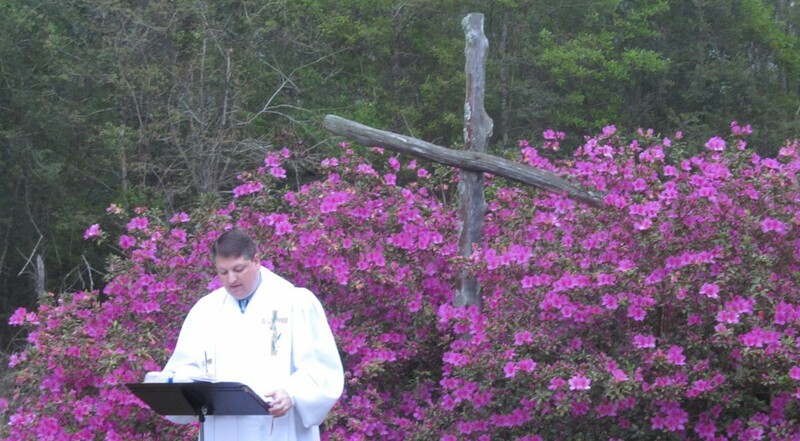 It is one of my favorite hymns to sing and the chorus says “I love to tell the story, ’twill be my theme in glory, to tell the old, old story of Jesus and his love.” It is a great hymn, with a great message but sometimes I wonder if we have not told the story of Jesus as well as this hymn challenges us to do. I hope and pray that you and I will tell the story of family and faith through spoken words, facebook, twitter, even totem poles, but, by whatever means necessary, tell the story! Questions to consider: How do we pass down the stories and histories of previous generations in our modern technological culture? Who passed down the stories of faith and family to you? To whom do you need to pass down your story of faith and family? 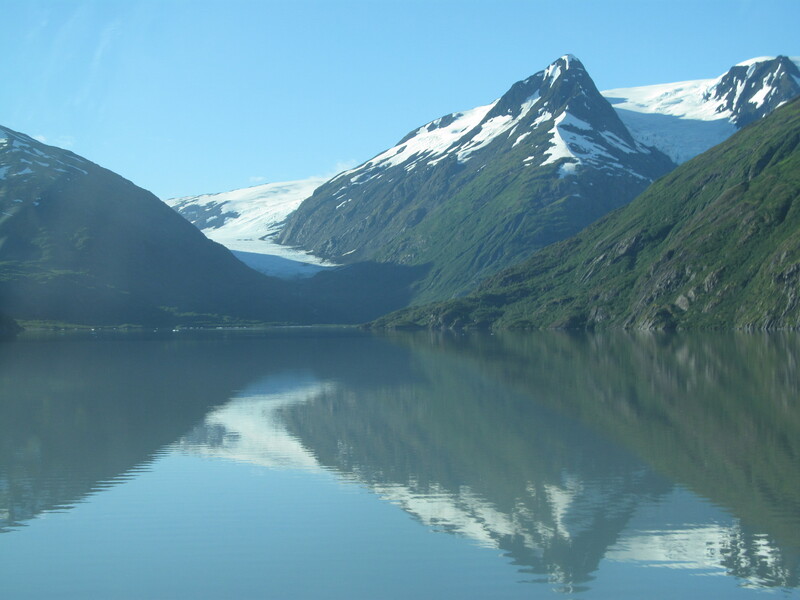 A view of the Portage Glacier with reflection in Portage Lake near Whittier, Alaska. I haven’t written for a few weeks because we took a 12 day cruisetour to Alaska aboard the Norwegian Sun. It was a great trip, but I felt small when I was in Alaska. It’s not often that I feel small. At over 6 feet tall and upwards of 250 pounds, I consider myself a pretty good sized fellow. I was almost always on the back row of the photographs because of my height, and, when I was younger, played goal keeper for our soccer team because I was so long and lanky. The US Marshals’ Service, District of Alaska, has a great graphic available that provides an Alaska size and distance comparison with the lower states. Maybe it is the sheer size of Alaska that made me feel small. Alaska is the largest state in the United States in land area at 586,412 square miles, over twice the size of Texas, the next largest state. It is larger than the combined area of the 22 smallest U.S. States. Alaska is even larger than all but 18 sovereign countries. The United States purchased Alaska from Russia on March 30, 1867, for $7.2 million ($121 million adjusted for inflation) at approximately two cents per acre! (source http://en.wikipedia.org/wiki/Alaska) We spent almost 10 days in Alaska and visited several of its largest cities and one of the largest US National Parks (Denali) and still feel like we only saw a small portion of this gigantic state! Alaska is a big place! 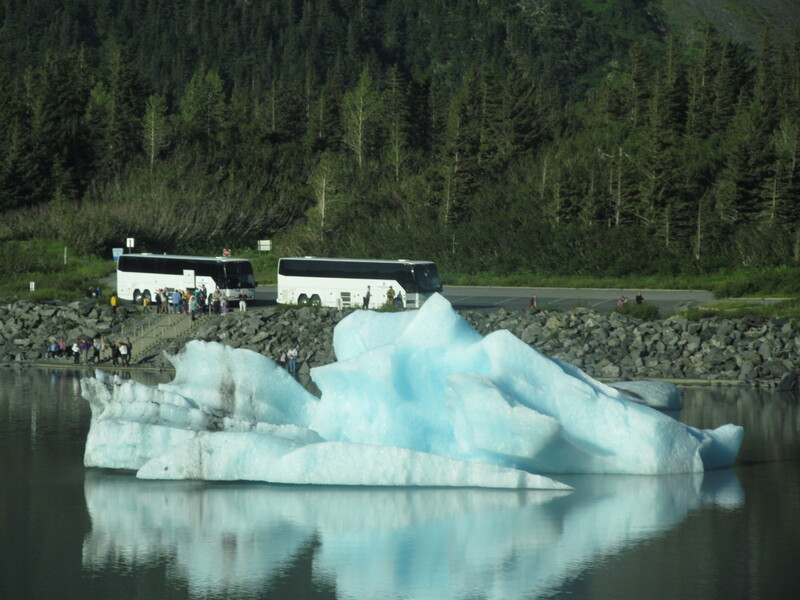 An iceberg in Portage Lake from the Portage Glacier dwarfs tour buses near Whittier, Alaska. Maybe it is the vistas of Alaska that made me feel small. It was amazing to look out from our hotel on the side of a mountain near Denali National park and to see snow on mountains that were miles and miles away. Mt. McKinley was over 80 miles from our hotel, and yet could be seen on a clear day, though the hotel admitted they could only see Mt. McKinley about 2% of the time. We saw glaciers that were 25 stories tall (Marjorie Glacier in Glacier Bay National Park) and even 40 stories tall (Hubbard Glacier- North America’s largest glacier)! You get an idea of how big the icebergs glaciers like these can produce by noticing how the iceberg dwarfs the tour buses in the picture. We even went so high up in Denali National Park that we went above the timber line on a Tundra Wilderness Tour and could see for miles and miles (though it was bit disconcerting to look over the edge of the road and consider how far off the ground we were)! Alaska has some beautiful and large vistas! 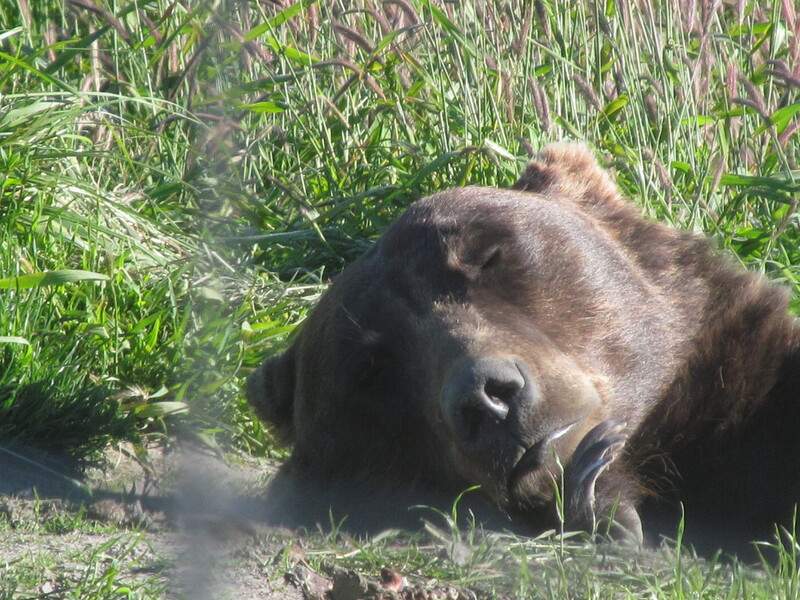 A Grizzly Bear at the Alaska Wildlife Conservation Center naps in the morning sun. Notice the size of his mouth and claws! Maybe it is the wildlife of the Alaska that made me feel small. We saw Bald Eagles, Humpback Whales, Sea Lions, Seals, Otters, Moose, Grizzly Bears, Elk, Yaks, Wood Bison, Dall Sheep, Caribou, and many other kinds of Alaskan wildlife. Many of them are BIG. At the Alaskan Wildlife Conservation Center, we got up an up close and personal view of a Grizzly Bear. The huge size of his claws and paws were astounding and frightening at the same time. We were fortunate to see Moose, Grizzly Bears, and Caribou in the wild in Denali National Park. While there are some smaller animals, Alaska has many large animals, some of the largest in the world. Alaska has some amazing and large wildlife! Experiencing the grandeur and size of Alaska made me feel a little small and I thought of these verses from Psalm 8: “When I look at your heavens, the work of your fingers, the moon and the stars that you have established; what are human beings that you are mindful of them, mortals that you care for them? Yet you have made them a little lower than God, and crowned them with glory and honor.” (Pslam 8:3-5 NRSV) It is an amazing thought that such a BIG God, who created so many wonderful and beautiful places like Alaska, Louisiana, and all points in between, could be mindful of us and care for us! The truth is that we don’t have to go to Alaska to feel small. Maybe you are small in stature and are constantly looking up to others. Remember to look up to God and follow God. Some of the smallest people in stature I have known have been spiritual giants. Maybe you feel small because of an illness or a disease. God is bigger than any ailment that we face. Maybe you feel small because of humanity’s greatest enemy, death. God has defeated even death through the life, death, and resurrection of Christ. And the good news for us is that when we feel small, let us remember that there is a BIG God who loves and cares for us. No matter your size or how you see yourself, God is bigger than any challenge or problem we could ever face. And that is good news, whether you are short or tall, healthy or ill, having a good day or a bad day. We may feel small, but we have a BIG God!